When I visited Material Obsession in January I had a project in mind for when class started in February. Somehow that project did not come home with me but this one did! I could not walk away from this quilt called, “Garden Party” which was co-designed by Kathy Doughty of Material Obsession and Anna Maria Horner using Anna’s fabrics. It is a delight to the eye and the fabrics are so hopeful and cheerful. It is a joy to work on and I can’t wait to finish the background to start on the flowers that will rest on top of this feast to the eyes. Have a great weekend and happy sewing. The wind has been slamming a lot of our upstairs doors when the windows are open. There must be some sort of serious wind tunnel created up there that slams the doors shut with such a heavy force that I jump out of my skin. 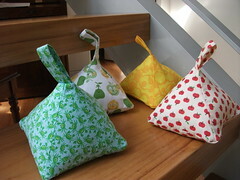 I looked up this tutorial and made these doorstops from a few fun fabrics that I had on hand. Such a fun, easy project and so satisfying when it solves just one of the many issues on the “need to get around to” list. I finished the hand quilting on Rhys’ quilt and now to the binding! Quilting class started last week and I have a lot of sewing to do! I found this very cute craft idea in one of the newsletters I received from Kids Craft Weekly which is one of the best kid craft resources out there. 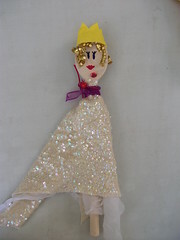 You take a wooden spoon, tie some fabric around the neck for a dress and decorate. Sloan loved it and took the creative initiative to make a necklace and crown for her too. Quilting is coming along well. I don’t think I will finish before Wednesday, but I will be pretty close. Right now the quilt is competing with the book, “The Girl With The Dragon Tattoo”. I was reading along quite happily and then it hooked me and I am like a drug addict sneaking upstairs to read my “hit”. I had lofty goals this summer with a huge to do list of things / projects I wanted to accomplish. 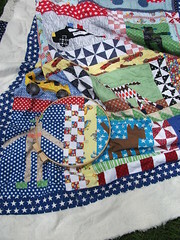 On the top of the list was the hand quilting of this quilt. 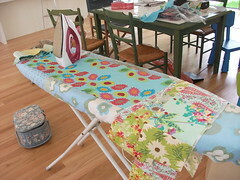 My goal was to have it all quilted before I kicked off my Material Obsession class in 2010. unfortunately I found my goals pushed aside for some much needed summer entertaining in the new house and just splashing around in the pool with the two kids. We had a magic summer and happy that the to do list was derailed. School is back and I have two days free while my baby is in preschool! In every free moment at night after the kids are asleep I am furiously quilting. My class starts next Wednesday and the reality is I find I only have bandwidth for one project at a time- hence the self imposed deadline so I can start a new project. I only have the last row of blocks to quilt so I am going to sign off now and get quilting!